Home > Settings > Emails > What are dynamic fields? Dynamic fields are the words you see within brackets in emails. These are fields which will automatically be customized based on a member's information. Our system will automatically fill in these fields everytime an email is sent to the member. There are set dynamic fields created by Farmigo. How to add a dynamic field? 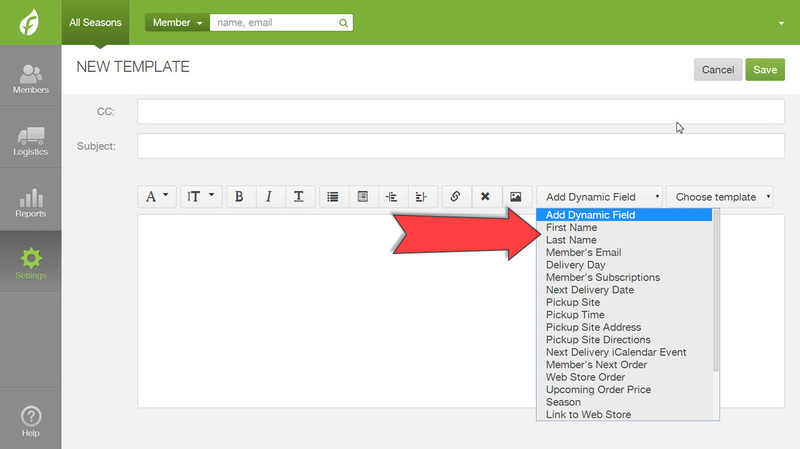 You can add a dynamic field to an email by placing your cursor where you would like the field to show up. Then, select the dynamic field you would like from the dropdown list. Below are examples of what dynamic fields will look like once they are filled in by the system.